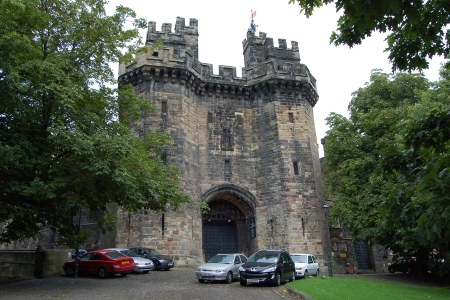 Many people walk up to Lancaster Castle – see that it’s a working prison and turn away. I did so several years ago when I first visited Lancaster. If however you walk around to the left of the castle there is a visitors entrance within the adjoining Shire Hall with regular (approx every half hour) tours around the courts and a part of the castle. The entrance warns that whilst children of all ages are welcome the tour is around a working court and therefore disruptive children will be asked to leave (with a refund of admission fee). This was nearly enough to put us off, but it was raining and so we thought we’d give the tour a go. Fortunately the court was not in use as it was during the holiday period and a weekend so there would not have been any problems and our children were well behaved, but toddlers are not always so predictable when bored. Lancaster Castle is delighted to welcome children of all ages but we must remind visitors that it is a working building. All visitors are therefore asked to respect any requests for quiet made by members of staff. There are certain areas of the building where noise travels very easily and this can be disruptive to other people working on the premises. In exceptional circumstances, the management reserves the right to ask people to leave the building if their behaviour is considered to be disruptive to other members of the tour group or other agencies working in the building. In these circumstances, a full refund will be given. The tour is mainly around Shire Hall which houses the crown court. As photos are not permitted in UK courts this means that they cannot taken at any point during the tour and so I don’t have any photos of inside. There are a few small photos on the Lancaster Castle web site. The tour also included some of the legends of the Lancashire Witches (Pendle Witches) and the Ghosts thought to Haunt the castle. Although if you are interested in that then there are special Dark History Tours and Ghost / Halloween talks (see Lancaster Castle What’s on guide). This entry was posted on Tuesday, September 21st, 2010 and is filed under Children, Days Out, Family, General. You can follow any responses to this entry through the RSS 2.0 feed. Both comments and pings are currently closed.